Making quilts to keep you cozy! Announcement Welcome to Quest Quilts! Feel free to look around here or visit me at questquilts.com! Welcome to Quest Quilts! Feel free to look around here or visit me at questquilts.com! Beautiful and well made. My husband loved it! Thank you so much!!! This seller was very responsive and helpful. The four quilts I purchased for my grown children for Christmas are absolutely lovely and definetly made exceptionally well. She packaged them perfectly and I received them quickly. 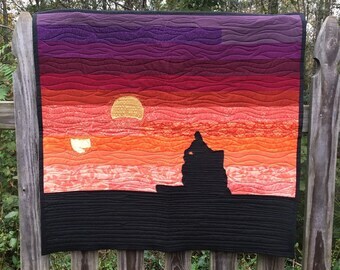 I would recommend this sellers work to anyone looking for a high quality handmade quilt. I can't wait to see how much my children love them and know they will cherish them. Thank you!!! Green and Gold stadium lap quilt. Up until my father's passing, I had only dabbled in quilts, making a couple for my niece. When he passed, my grandmother informed me I'd be making four, FOUR memory quilts from his clothes for my grandmother, myself, and my two sisters. One doesn't argue with one's grandmother, so I got to work. From those original four, I started making senior quilts for students and on to memory quilts. Recently, I started making ready-made items, specifically stadium and lap quilts. I enjoy the process and the creativity involved. They are fun and a nice change of pace from my usual t-shirt quilt orders.